Home » Coast to coast » Anti-cop-brutality activists win for women prisoners at Santa Rita Jail, Oakland, Calif.
Anti-cop-brutality activists win for women prisoners at Santa Rita Jail, Oakland, Calif.
Justice for Alan Blueford protest in Oakland where the four women were arrested, February 2014. Four activists, arrested in 2014 for protesting police brutality and killings in Oakland, Calif., filed a civil rights suit against the Santa Rita County Jail. On Aug. 1 they won a victory for all prisoners sent there. The four were arrested Feb. 13, 2014, inside the State Building in Oakland. Weills is a National Lawyers Guild legal observer, and the other women are members of the Justice for Alan Blueford Coalition. 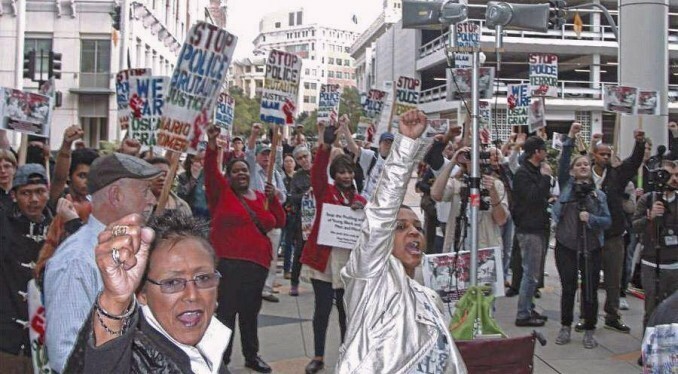 The protest was against California Attorney General Kamala Harris’ failure to prosecute a single killer cop, including Oakland cop Miguel Masso, who killed young Alan Blueford in 2012. Their statement details the anti-woman and degrading conditions in the SRJ: “The Four were taken into a public hallway and told to strip to their bras. Outraged at this, the Four protested, and one was forced to walk around in that state in front of male guards and prisoners. Two of them were then locked in isolation cells and denied access to a toilet for hours. The Four won seven concessions from the SRJ: 1) women prisoners’ right to privacy, including a screening curtain; 2) a never-before-required program to train cops assigned to the new arrestee area; 3) a mandatory check on detainees, especially those in isolation, every 15 minutes; 4) the prohibition of cops “grasping or kneading” the body of an arrestee that they are searching; 5) mandatory garbage bags in cells with women prisoners; 6) menstrual pads provided to all women prisoners; and 7) cells cleared of garbage and sanitized regularly.